It's Plastic Free July! 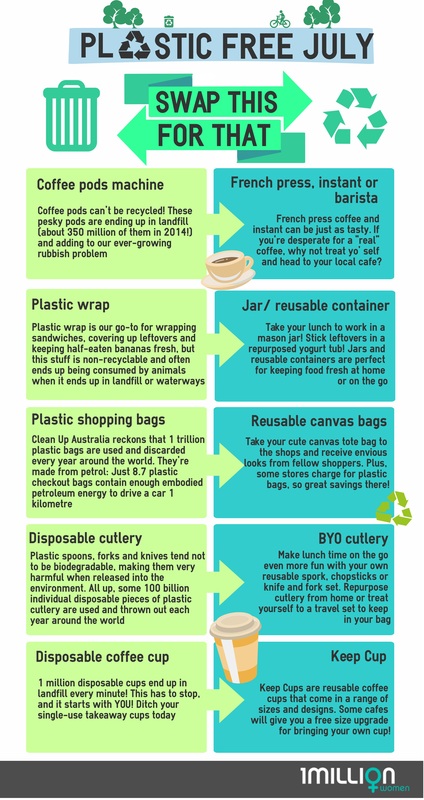 Here are some helpful tips to help you to find environmentally friendly alternatives to the plastic that sneaks into your everyday life. Plastic Free July aims to raise awareness of the amount of single-use disposable plastic items in our lives. It challenges people to do something about it. You can either opt to remove ALL single-use plastic items from your life or just PFJ's TOP 4, which are straws, plastic bottles, plastic bags & coffee cup lids. Subscribe to take the challenge on the PFJ website here. Reject or cut back on these bad-for-the-environment items: over-packaged products, non-recyclable packaging, plastic bags and bottled water when tap water is available.